But if you play this game with Walter, you don’t get a typical answer. Yes, Walter has a favourite colour and a favourite song. But the name of his best friend will surprise you. Because Walter doesn’t have just one best friend, but two. You see, Walter has Leigh’s Syndrome, a severe neurological disorder that becomes apparent in the first year of life. It causes muscles to be weak and sore and cells are unable to produce enough energy to run a body. Essentially it would be like trying to run an entire household on a single battery. It’s characterized by progressive loss of mental and movement abilities, and can be fatal if left undiagnosed. Fortunately, Walter received his diagnosis early on, and began coming to KidsAbility multiple times a month for physiotherapy, occupational therapy and speech therapy. 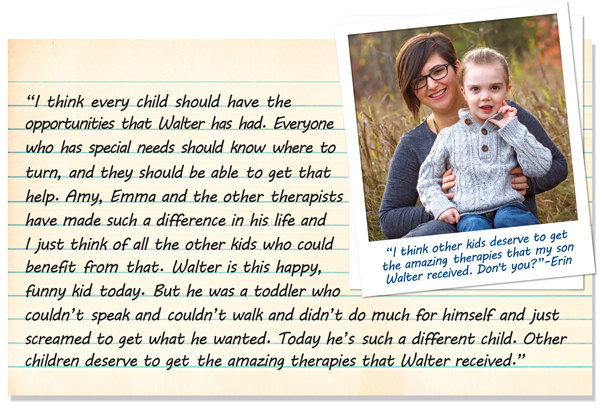 The difference these therapies made in Walter’s life is literally life changing. When Walter came through our doors for the first time, he couldn’t crawl. He couldn’t sit up. He couldn’t talk. He couldn’t gain weight. He was off the charts in the wrong direction for all of his developmental milestones. But today, thanks to the intervention of our therapists and with your support Walter walks—and never stops talking! Thanks to Amy and Emma, Walter is now walking and talking. Walter is a living testament to the difference your financial support makes in the lives of the children that we serve here at KidsAbility. Early intervention plays a vital role in helping children reach the goals that are important to them. That’s why, through a talented team of therapists, teachers, support staff and volunteers, we help almost 8,000 children and youth, from birth to school exit, benefit from therapy and support services. Your donation today helps us serve even more children with the therapy they need to reach their potential. Won’t you please give generously right now to support our vital therapy programs? P.S. For many children, the only thing standing between them and therapy is funding. Children like Walter need your support.